Motto ;- "United We Stand Divided we fall"
REPORT ON THE 2015 EVALUATION VISITS TO NOWEPIFAC GROUPS AND PROJECTS. This report which actually is the first of its kind since the creation of the North West Pig farmers Cooperative renders account of the current situation of NOWEPIFAC active groups and also gives an evaluation of some group/community projects that were sponsored in the past. The team of evaluator were members of the February 21st 2015, newly elected project committee by ACEFA staff for Mezam Division Mr. Chungong Divine. The visits were made following the schedule and work plan you can see bellow with a common agenda of all the meetings. This report provides facts on the actual situation on the field as well as images and names of those who were present at the time of the evaluation on the side of NOWEPIFAC as well as on the side of the groups visited. In some groups, conflicts were resolved. With reference to the speech of the president on the 22nd December 2014 where he said our Dutch partners and others have requested for an evaluation report of NOWEPIFAC groups and projects, the schedule visits above intend to carry out a detail finding on the situation of the active groups of NOWPIFAC and that of some past sponsored projects as well as on-going projects. This report provides facts on the actual situation on the field as well as images and names of those who were present at the time of the evaluation on the side of NOWEPIFAC as well as on the side of the groups visited. In some groups, conflicts were resolved. The visiting team was made up of members of the project committee that were voted on the 21st February 2015 and for each visit the number that went was influenced by the means of transport. The team went to some places by motor bike and to others using the private car of the president/ project coordinator. Prior to the visit a questionnaire was prepared to help the team obtain answers to the most relevant questions beside using their eyes to see and appreciate. Depending on the interactions, more questions may came up from members and the team will face them as you will read from this report. The guide lines in the circular letter bellow were sent to all group leaders with the above visit schedule, one week before the start of the first visit. # Circular letter to all groups. The host groups are expected to welcome the visiting team formally with all group members present at the stipulated time frame. The groups are expected to make a contribution that will make up for the transport of the visitors. The team from Bamenda shall be led by the various group leaders to their project sites and these leaders will be expected to respond to a number of questions relating to their group situation or Hans Blanket funded projects. The groups visited should have their visitor's book signed by the visiting team for reference and prepare an attendance list whose copy will be handed to the team. You may expect questions like the following from the visitors. They will be some announcements and information sharing before the close of each meeting. What has been your major achievement over the years? What has been your main constrains over the years? In which area do you expect advice or further support? Can you provide copies of previous reports to hierarchy on the progress of your project? If not why? What is the level of group members' participation in the project and what is their motivation ? What is your level of collaboration with the Apex organization since project was funded? Are there any existing conflicts within the group that the team can resolve? Receive the annual dues contribution form for 2015. Appeal to members to buy shares and put cooperative feed store more functional. Ask members to review and provide inputs to the proposed action plan for 2015. We will be receiving two guests, one from Japan and another from America coming for Asian Rural Institute (ARI) graduate impact study on the Thursday 16th April 2015. If you lose contact of the team you can call either of the following numbers;- 677578599, 653253131. Thanks in advance for the usual collaboration and African hospitality. Left: Falling apart because of bad leadership / Right: "You want to take over power from me, no way"
2nd Group;-Tchi- Ncha mixed farming group, Saturday 28th March 2015. This group of dynamic women welcomed the team in a very special way at the home of one of its members. The team visited their pig farms to see what was there and found out that their pig were not well fed and when ask why they said that composing good food for the pigs was not that easy for them. They ask that the cooperative should assist them with composed feed on credit so that they can pay back the money when their pigs are sold. 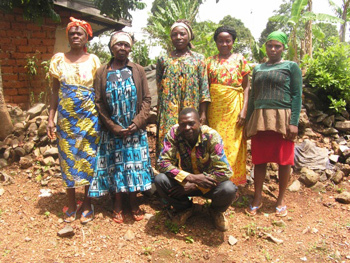 Majority members of this group attend general meetings of the apex organization NOWEPIFAC both in Bawock and also in Bamenda and have been participating in most cooperative activities. They have started making contributions for their annual dues 2000frs each as agreed during the meeting of February 21st 2015. In all this group have 10pigs and 8piglets from one of the mother sows of one member. 3rd Group;-Baform Mixed farming Group, Saturday 28th March 2015. The Baform group members waited in time for the visiting team that also arrived at the scheduled time. All members of this group have paid their 2015 annual contribution and the money was kept by their treasurer. Members of this group are noted for their enthusiastic participation in community work organized by the apex organization, NOWEPIFAC as well as meeting attendance. One of their members was accused of lacking the spirit of participating in group meetings and the conflict was resolved by advising the group to accept the members as she promises to change her attitude toward the group's activities. Left: We are united / Right: "Lack of Feed is my greatest problem"
4th Group;-Fumjoh Mixed Farming, Saturday 28th March 2015. 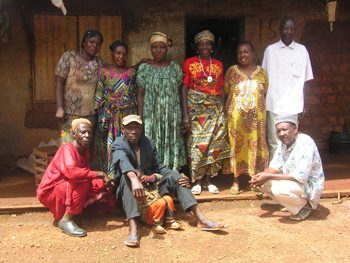 Members of this group live not far from each other and they have family links with each other. You have husband and wife as well as brothers and sister. Three members of this group benefited from the SOS Piglet Multiplication project funded by the Dutch embassy in 2009 and all the three pig fences have a good number of pigs/piglets, which clear evidence that this project within this group is quite sustainable. The rest of the members have also benefited from the Pig Van Djouke Project, receiving pig and feed. Six members were in attendance for the evaluation meeting. Members of this group were yet to start paying their 2.000 FRS annual dues for 2015. They received the visiting team with a lot of hospitality and supported their movement with 2000 FRS CFA. Members also promised to support re-stocking of the Bawock feed store by making a share contribution that will raise the running capital to start the feed store. They were invited to join other groups in the reception of two people, one from Japan (Mr. Steven) and the other from America (MdeBev) on the 16th April 2015 at the Cooperative head office in Bawock. They were coming for an ARI graduate impact study because NOWEPIFAC general president just returned from Japan December 2014. The photo bellow of the group members only ended the visit. Left: "Together we stand, divided we fall" / Right: Mabeh "Our President is our example"
All members were present on time for this meeting and all of them have contributed the cooperative annual dues of 2000frs each. The meeting started with an opening prayers offered by the group acting president MdeNgassoEvelyne. The group is said to be very peaceful without any pending crisis to resolve and all the three fences constructed by the Dutch embassy project funds were occupied with pigs. Members were advised to join the share holders' scheme of the cooperative in order to revamp the cooperative feed store and put the cooperative feed store ones more functional from its deadlock state. It was agreed that on the general meeting day to be scheduled to appraise the evaluation visits, members of this group as well as others will bring a list of persons interested to join the shareholder scheme and another meeting of these persons only will be called up to discuss how to engage in the pig cooperative feed business. The annual dues money collected will be handed to the treasurer on the meeting day that ends the visit. After some refreshment the meeting ended with a group picture and a visit to the fence of Mr.Gearge to confirm the female piglet handed to one of the group members which was alleged to be too small for POG(Passing on the Gift). Members contributed 2000 FRS to make up for the fuel of the evaluation team. "Selecting a female piglet for our POG beneficiary member"
Meeting attendance was very poor and made up of only members of one family. The group delegate, present with her daughter said members were disgruntled for a reason unknown to her so refused coming for the meeting. Delegate and member were advised to make up shares for the feed store. Further discussions were centered on rebuilding the group and members were reminded to attend the end of evaluation meeting to schedule later on. 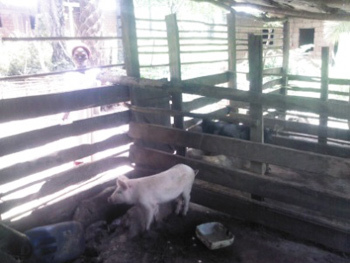 O piglet Multiplication project funds were in use,that is, having pigs inside while one was not being used. The cooperative feed mill equipment and some documents in Bawock are kept by the delegate of this group pending the completion of the Cooperative building. The visiting team was given 1000frs to make up for fuel transport from Bamenda. Meeting did not hold but the team met with some members in front of the Delegate's house and they said their group delegate did not inform them about the visit, so pleaded that the meeting be re-scheduled for another day. The group Delegate MdeHellen was be-rived and so absent so the team left very disappointed. 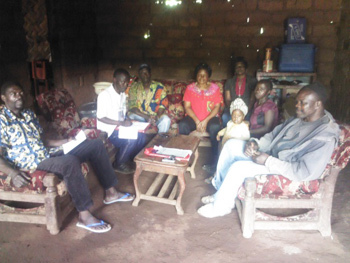 At the general assembly meeting that took place on Friday 24th April 2015 in Bawock to evaluate the visits and take resolutions, another meeting for Douala Fed- Fed group was scheduled (after discussing with the group delegate and some members) for Wednesday 29th April 2015 at 9.00AM prompt. All members were advised to be present and on time. "Sorry we had no information about your coming"
Despite the fact that members of this group were notified ahead of time, some of them were unavoidably absent. Those who were present came on time. 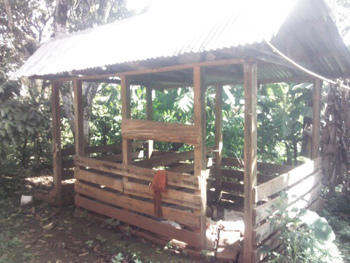 Before starting the meeting, the team of evaluators went to check on the pig pen donated by the Dutch embassy in Yaound? to the group delegate MdeHellen. It was quite shocking and disappointing that the fence was empty and ask why MdeHellen said when she put pigs inside the pen the pigs die and she said the government vet authority of Bawock advised her to remove the plumb tree that shaded the pig pen. When advised to allow the pen be used by another member instead of allowing it empty she said she was to occupy it as soon as in two weeks' time. During the meeting we realize that members were in conflict with the group delegate and so prefer to deal directly with the cooperative administration directly rather than by passing through their group delegate. Gossiping and back stabbing between members was said to be the main problem so much so that information flow was difficult because no love existed amongst members. Participation in the group farm activities and weekly/monthly contributions were no longer possible, therefore the group was disintegrating slowly with time giving the reasons for the poor meeting attendance rather than the false excuses/justifications given for their absence. The common advise given to the group was that of true reconciliation rather than disintegration given the fact that gossiping even though not good is common among human and difficult to eradicate. The group was advised to regain their group activities and continue with regular meetings to exchange views and share their joy and sorrow together as one family because the success of the apex organization NOWEPIFAC depends very much on the strength of its member groups. Good example of wasting resources. (Donatedpig pen not under use). This is rather unfair and must be strongly condemned because those who actually need it don't have. Whose fault??. Left: It is not a crime to speak out your mind. / Right: We could be more than this number, but why? 8th Group;- Struggling Women Mulang, Monday,6th April, 2015. This group benefited from the Hans Blanket Fund with a five rooms pig pen having pigs and sufficient feed supply to start off with. The group delegate who got information of our coming one week before the day left for the farm at the time the visit was scheduled to take place. Out of frustration the visiting team decided to visit he projects site with a neighbor to the delegate to see what was on-going. Behold, there was nothing to show as remnants of the project at the site. 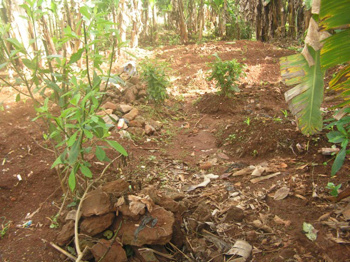 We rather saw maize and beans growing on the project site. NOWEPIFAC, the apex organization that applied for the project funds was never informed about the intension to close the project and knows not about where the material removed from the site has been taken to. 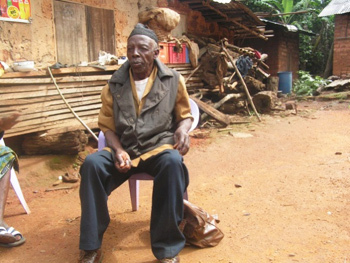 This action of this group is in violation of the state laws of Cameroon governing groups and cooperatives. We shall act accordingly after hearing first from the donor organization, Hans Blanket, Pum the Netherlands. 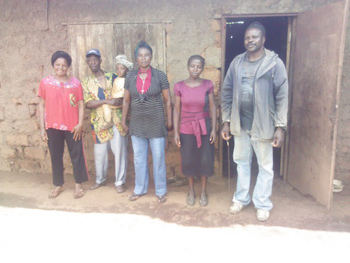 "Project site now empty, no pigs, no structure"
This group is led by Madame YariHotencia , the honorary treasurer of NOWEPIFAC resident in Bamenda town. And busy despite the fact that she got the circular she said because of her busy schedule with their village credit union she will not have time to go home to invite members for the evaluation meeting. She also said she was going to re-schedule a date for the meeting. After waiting for another date for almost a month, the evaluation team decided to go to the Hans blanket sponsored piggery project site to see for themselves what was there. 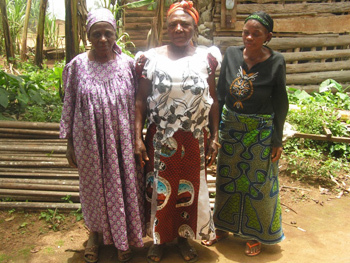 MdeHotencia contacted her focal person in the village Mooh who was sick and unable to welcome the team. 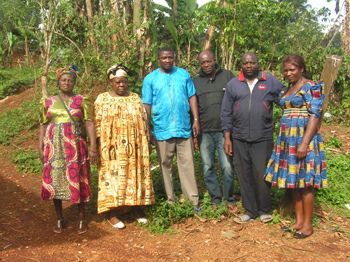 The team made up of Mr.Wato Samuel and Titus left for Baba 1 Ndop in the morning of Wednesday 6th May 2015 at 8.00 am and before 11.00am they arrived the project site and what they saw is what you can see in the pictures bellow. 5pigs(one boar three guilt and one pregnant sow). 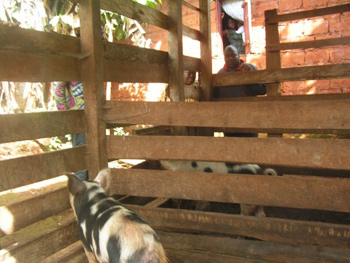 The project had expanded to other members and the pregnant sow in the picture bellow is owned by a beneficiary of the passing over the gift (POG). This farmer has no infrastructure but rather is currently preparing a fence with Indian Bamboo as preparation for the pig's delivery (Farrowing). At the site we were made to know that the group activities of the Feshang women were still going on very sustainably and strong to the extent that some Muslim women members decided to start pig rearing in Baba 1 community, quite strange enough. In the absence of MdeYariHotencia and her focal person in the village the team was left with no other option than to get back to Bamenda without exhausting the visit agenda as it was the case in other places. The take home message was that the project was very much alive and members needed support on housing to expand the POG and also to add the existing group fence. The also expressed the need of fencing the existing fence for fear of theft and also to control stray animals as well as persons from visiting their pigs. 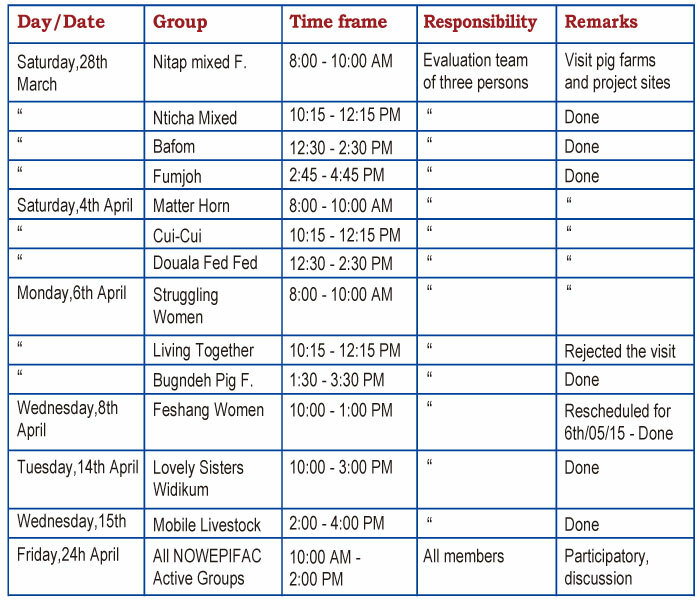 10th Group;- Living together Pig Farmers Nitop 1, Monday 6th April. 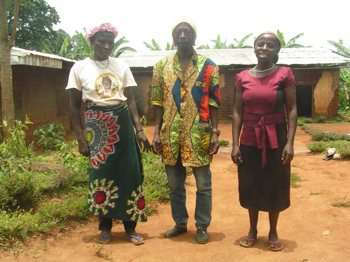 Prior to the above scheduled date of visit, the group delegate Mr. Agwoya Daniel called Nowepifac president/project coordinator on phone and said members of his group were not willing to receive the visiting team for reasons that none of their members have benefited anything from the cooperative since it was created. This call was made during one of their extra-ordinary group meeting called up by the group delegate to review and respond to the evaluation visit circular from NOWEPIFAC office that was sent to all delegates of groups to be visited. What sounds ironical and strange about these words of this group delegate is the fact that more than half the members of this group have benefited from the pig Van Djouke project receiving pigs and feed concentrates for their animal and some of these members have received more than ones. Furthermore,these utterancesof the group delegate were supported by NOWEPIFAC next in command, Mr. Gyeh Steven who is memberof the group giving his reasons that he has not benefited from the POG project of Djouke the Dutch girl since it started. Mr. Abundong Johnson, NOWEPIFAC board member and adviser who has benefited twice from the "Pig Van Djouke Project" and is the former delegate of this group is by implication accepting the idea that the group should not receive the evaluation team following the words of their new group delegate Mr. AgwoyaDaniel. Upon arrival at the group delegates place he was horridly getting into a passing taxi saying he was late for an appointment with his doctor at the hospital. As he moved away in the taxi, the visiting team saw another member/secretary of the group Mr. Kumcho Moses who confirmed what we heard from their group delegate on phone. He said, Hans Blanket fund has not sponsored any project for their group so needless receiving visitors for an evaluation. The team lamented with the wrong conception of the visit by these group members who thought the team was only coming to evaluate Hans Blanked funded projects. 11th Group, Bugndeh Pig Farmers, Monday 6th April 2015. This group is found in mile 18 Mbengwi capital of Momo division, 25minutes drive from Bamenda town center and the group is made up of 10 members. They have a piece of land owned by their group on which was established the piggery project funded by Hans blanket. Prior to settling down for detail discussion with the group members, the visiting team went first to the project to see what was there and were so impressed to see that the project was quite sustainable with pigs inside three of the five room fences. One was pregnant and soon to farrow and the other female was just ready for crossing. The boar used in serving the females was in a separate room, well fed and good lucking. NB (Images got stocked in the phone memory rather than in the memory card as our Camera was in crisis and we used the phone instead).. Present to receive the visiting team were four members as the others were busy with other social engagements. Mr.Housia who now is the new group delegate taking over from Mr.Tembi Joseph says he has difficulties running the group because several opposing views from the group members influence partly by his predecessor Mr. Tembi Joseph who wish that the group should not progress as NOWEPIFAC board came and removed him from the group delegate post. He even went as far as proposing that group landed property be sold and money distributed to members and that the project pigs/infrastructure be sold and money equally distributed to members. The new group delegate Mr. Housia, Mr.Munyam Roger and two others rejected the proposal and promised to refund whatever any of those in support of the proposal have contributed for the purchase of land or made as contribution towards the realization of the group project. He also said it was not realistic demolishing the project without concerting with the apex organization, NOWEPIFAC that mediated for its funding. He said that will be acting statelaw and regulation. After review our days agenda and passing on the necessary information to the group we congratulated the new group delegate for his firm decision not to dissolve the group and for their combine efforts to see the project at the level at which it is. They were also encouraged to have full commitment and participation in activities organized by the apex organization The group was briefed on the past training of NOWEPIFAC general president in Japan 2014 and the importance of that training to them as pig/agriculture farmers. A date for restitution training for the group will be scheduled in the days ahead. The team left satisfied with the deliberations and participation of the Bugndeh pig farmers in attendance. Lovely sisters Bifang have their head office in Widikum town, the capital of Widikum sub division. It takes 1 hour 30 minutes to drive safely to Widikum because the roads are very good nowadays. 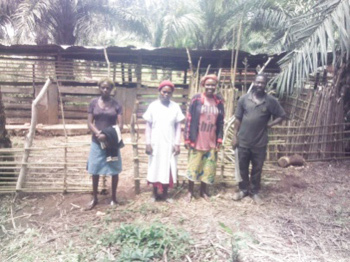 The oil press project of the group is located further in the village of Ambelleand reported not to be functioning with reasons that the engine has problems that the technicians in Widikum can not handle and attempts to bring the technician from Bamenda town failed. When ask why it failed, the group delegate MdeBukum Elisabeth said the technician was requesting for large sum of money which group members were not willing to contribute because the feel disappointed with the whole equipment which according to them have not saved them for long before beginning to have trouble. After a long debate and discussion with the members present for the meeting we came to the conclusion that while the group delegate find out the possibility of replacing the mill with a more serviceable and mobile one which they claim is in circulation around the village, NOWEPIFAC project coordinator will get back to Bamenda town and concert with the fabricators of the mill to know what actually is the problem with the Oil press engine and what it takes in total to put it functional again. 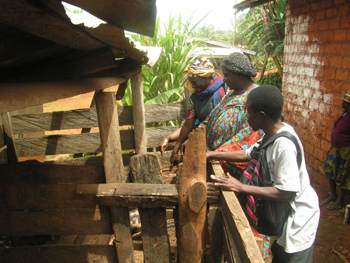 According to the members, even if the engine is repaired, it is not movable as others so the will always be the problem of how to bring the palm nuts for processing to the oil press which is on the same spot and people now prefer the mobile type because it come to the site of nuts and not vise versa. Faced with all of these difficult puzzles we came to the conclusion that the oil press after all will be replaced if we can sell the stationary one after considering/ resolving its current crisis with the engine. The visit agenda was exhausted and the relevant information shared before the close of the meeting late in the evening at the head office in Widikum at the residence of one of its members. The main objective of this group is animal welfare service and education. This group carries out a door to door animal health care service and organizes training seminars for farmers in different localities. Members of this group aremainly family and friends sharing a common vision and having mutual benefit from the professional activities of each other which are socially and economically supportive. For example, Mr. Bam peter that is a shoe manufacturer and does shoe repairs helps the family of Awah Wando as well as that of Atomba Titus in that domain. 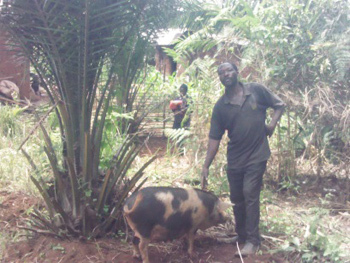 Mr. Atomba Titus treats and takes care of the health of the pigs and pets of the other two friends as a veterinarian. 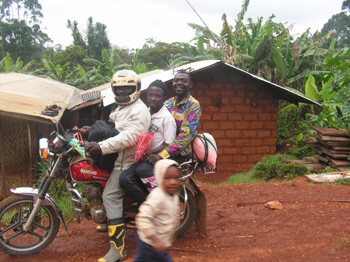 Mr. Awah Wando does motorcycle repair service, servicing the motorcycle which Atomba Titus uses for animal vaccination programs and general animal welfare service as well as repairs that of Mr. Bam peterl. These three family/friends share in the joy and sorrow of each other. 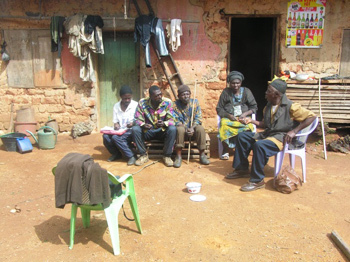 Another strong point of this group is the fact that they meet every Sunday at 1.00PM and Wednesdays at 6.30PM to discuss issues affecting the different families and during this time, they carry out a financial contribution popularly known as "Njangi" or rotatory serving scheme giving to one member and next time giving to another member. Neutral neighbors who are not members of MCLS but like the rotatory saving scheme are allowed to join. Through this Njangi contribution, members have been able to realize many family projects like building of their staying homes/houses (For Example, the homes of the three family friends, Titus, Awah and Bam), sending their children to school etc. It must be noted that this group is the founder of NOWEPIFAC and the brain behind the dreams, vision and mission of the North West pig farmers cooperative Society. It prepares proposed action plans for NOWEPIFAC general assemble to debate and adopt for implementation. 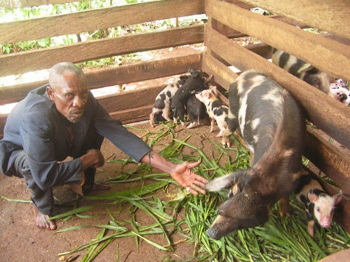 Two members of this group Mr. Bam Peter and Awah Wando have benefited from the Pig Van Djouke Project and have passed on the gift of female piglet to other deserving beneficiaries. Members of this group paid their annual contribution of 2,000Frs. each and as with the other groups the agenda of the evaluation visit was exhausted and Mr. Menga Robert, member of the evaluation team ask members of MCLS to make efforts to attend general assembly meetings in Bawock as they too are making efforts to attend the same meetings in Bamenda. He also ask them to buy shares so that the animal feed stores should have all the necessary feed ingredients needed to compose balanced rations for pigs. Mr. Wato Samuel reminded them of the visit of the next day, Thursday, 16th April 2015 which they were expected to come. NB;- Source of funding is group annual dues contribution and free will donation.